'THE MAN YOU'RE SEEING HERE NAK*D IS MR GABON IYIAKA FROM UMUDIOPARA UMUNAKANU OWERRI. IN EHIME MBANO LGA.HE WAS CAUGHT WITH CHARM TODAY AT CHIEF MARCEL NNODIM'S ( MARLEY) HOUSE WHEN HE WAS ATTEMPTING TO PLANT THE CHARM AT MARLEY'S HOUSE IN THE SAME UMUDIOPARA. MR GABON USED THE KEY HIS NATIVE DOCTOR GAVE HIM TO LOCK CHIEF.MARLEY NNODIM'S HOUSE BEFORE HE WAS CAUGHT. 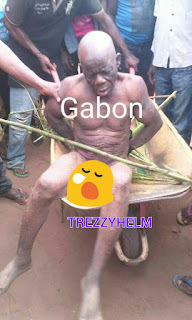 THIS SAME GABON IYIAKA WAS CAUGHT SOMETIME LAST YEAR WHEN HE WAS NAK*D AT A MANGO TREE AT UMUDIOPARA SQUARE BATHING. THIS MAN WAS CAUGHT IN CHIEF MARLEY'S HOUSE ON 14TH DECEMBER 2016, HE SAID HE WAS DOING WHAT THE HOLY SPIRIT DIRECTED HIM TO DO. THE CASE WAS POSTPONED TILL DURING THE XMAS. 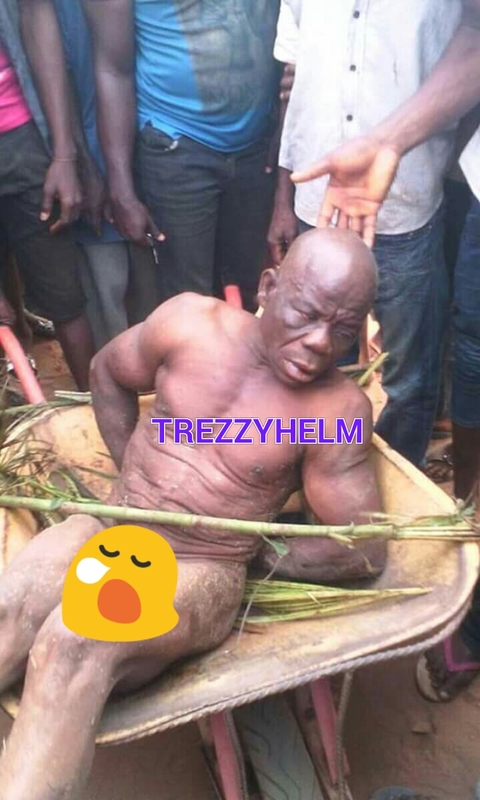 JUST LAST NIGHT 19TH DECEMBER 2016, THIS SAME MAN WAS CAUGHT AGING RED HANDED DOING THE MAIN THING, PLANTING CHARMS IN THE SAME CHIEF MARLEY'S HOUSE. THIS MAN IS EVIL RIGHT FROM MY CHILDHOOD. HE DESERVE NO PITY. THANK GOD TODAY IS MY VILLAGE MARKET DAY. 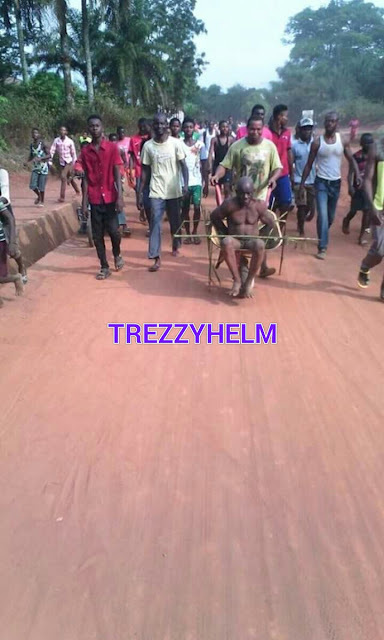 GUESS WHAT THE YOUTHS ARE DOING WITH HIM IN THE MARKET. CHIEF MARLEY IS A POLITICIAN, PHILANTHROPIST, A WELL KNOWN INDIVIDUAL IN EHIME MBANO BUT HE HAS BEEN FINDING IT SO DIFFICULT TO EAT FOR THE PAST 2 YEARS'.